How long will my patent application take? A couple of patent law professors run a great patent law blog called Patently-O, and they recently came up with a great chart showing how long it takes to get a patent issued once it’s been filed — an average of 34 months. If you’re interested in patents, you should check out Patently-O — it’s got great commentary on most of the important patent cases from the last several years. Last month, I posted about the Patent Dashboard, a fairly new feature on the USPTO’s website that provides statistics on how quickly and how well the USPTO is examining patent applications. Last month, the USPTO’s Director announced a new Trademark Dashboard aimed at providing the same type of information for trademark application pendency. Currently, a trademark applicant can expect to hear something about an application within 3 months. 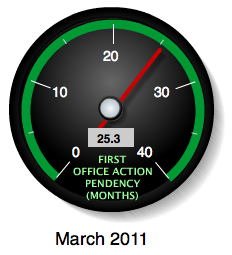 Assuming no problems, total pendency is averaging a little under a year. The new tool provides tons more useful statistics. As a practitioner, it is helpful to have this information available so I can give my clients a firm estimate of how much time it will take to secure a federal trademark registration. This represents a step in the right direction for the USPTO, which has been plagued by a lack of transparency about its operations in recent years. Last fall, the U.S. Patent & Trademark Office (“USPTO”) unveiled its Data Visualization Center, which is a real-time reporting tool showing the USPTO’s performance in examining patent applications. The Patent Dashboard feature shows several metrics for pending patent applications. The USPTO currently issues its first substantive action on the average new patent application 25.3 months after the filing date, and is currently issuing patents a little less than 3 years after the filing date. Over the last several months, the USPTO has added staff and made a concerted effort to reduce the application backlog. The result has been a reduction in the total pendency time for new applications. These figures are great for people (especially new clients) who are thinking about filing a new patent application. Once an application is filed, the USPTO will provide an estimate of time to the first office action for that particular application. Clients who want to know this information can call and ask for this estimate, which we can retrieve quickly through the USPTO’s Private PAIR system.